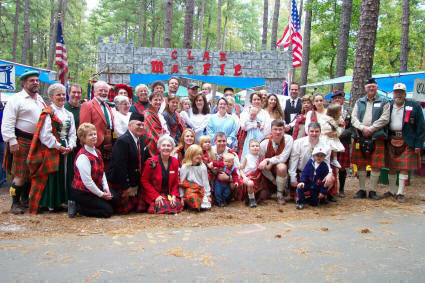 The Macfie Clan Society of America was formed on December 21, 1982, largely due to the efforts of H.R. Scott McPhee and his wife Marvene. This great vision that began with a handful of charter members has now grown to roughly 300 members strong. The Clan Crest is a demi lion rampant (as seen on the far left). Membership in the Society is open to all interested men and women who have surname spellings listed under accepted spellings, those who are connected by marriage with, or descended from anyone with an accepted surname. Athey, Cathie, Cathey, Coffee, Coffie, Currie, Curries, Curry, McAbee, McAchopich, M\'affeith, McAfee, MacAfee, McAfie, MacAfie, McAphie, McCaffrey, McCafferty, McCoid, Makcoffee, McKoffee, MacCuish, MacCowis, McDiffie, Macdoffy, McDuffie, MacDuffie, MacDuphie, Makduffie, Duffy, M\'Duffe, Dufacius, Duphaci, McDuffphie, Makduffie, McDuffyhe, Mcduphe, MacDhubsite, Dubside, MacDufthi, McFeithe, Makfeithe, McFie, MacFie, Mcfeye, Fee, Makfee, McFee, Magoffin, McGuffie, MacGuffie, MacHaffie, Mahaffy, Mehaffey, Mahathie, McIfie, McIphie, Phe, McPhe, Phee, McPhee, MacPhee, McPhie, MacPhie, Mac-a-Phie, McPheir, MacPhietric, and MacPhied, MacVie, MacVee, and other spelling derivations. Following the worldwide rallying of Clan Mcfie members by Dr. Earle Douglas MacPhee of Vancouver, BC, Canada, the Lord Lyon King of Arms recognized the Clan on May 27th, 1981 as being once again, an active clan. In 1993, Clan Macfie met in Parliament on the island of Colonsay for the first time in 370 years. About 120 Macfies representing Macfie societies around the world, met on the ancestral homeland. Some property was donated by the Lord Strathcona, present owner of the island, to erect the Standing Stone as a memorial to Malcolm Macfie the last clan chief. Sandy McPhie, of Australia, was appointed as Ceann-Cath (or commander) of Clan Macfie by the Lord Lyon King of Arms on September 7th, 1989. Thus, May 27th was chosen for Clan Macfie Day by the members attending the 10th International Gathering and 6th Parliament of Clan Macfie on Colonsay in 1993. In March of 2008, Commander Sandy McPhie stated that he would stand down as Clan Commander. An ad hoc derbhfine convened to select a suitable candidate for appointment to that position. In the fall of 2008 the Lord Lyon appointed Iai​n Morris McFie as Commander or Ceann-Cath of Clan Macfie.